The more the merrier, as they say. Maximilian has posted part seven in the "WEEK OF!" Super Street Fighter IV: Arcade Edition 2012. Seven parts in the "WEEK OF!" Super Street Fighter IV: Arcade Edition 2012 (AE 2012) have been posted by Maximilian. 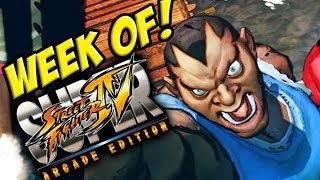 We've been following Max's week with both AE 2012 and 3rd Strike. For the first six parts in the "WEEK OF!" AE 2012, click here, here, here, here, and here.